Stand up paddle boarding is a super easy water sport to learn and you can become an expert paddle boarder in no time. People of all ages, shapes, and sizes are learning to paddle board in just a few hours with proper instruction. 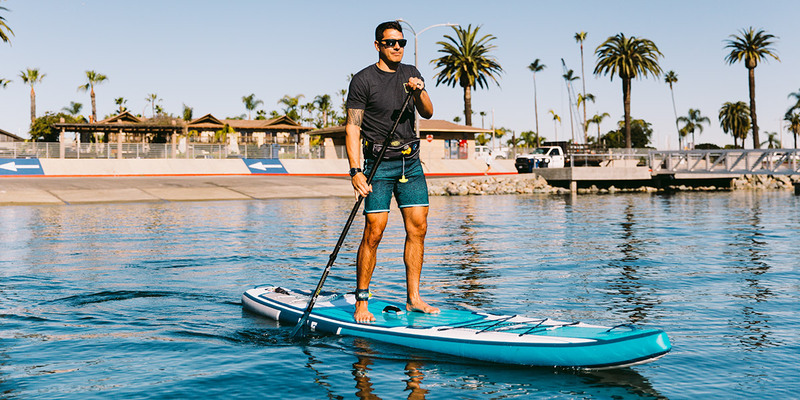 Not only is paddle boarding easy to learn but it’s fun, gets you outside and is a great full-body workout. 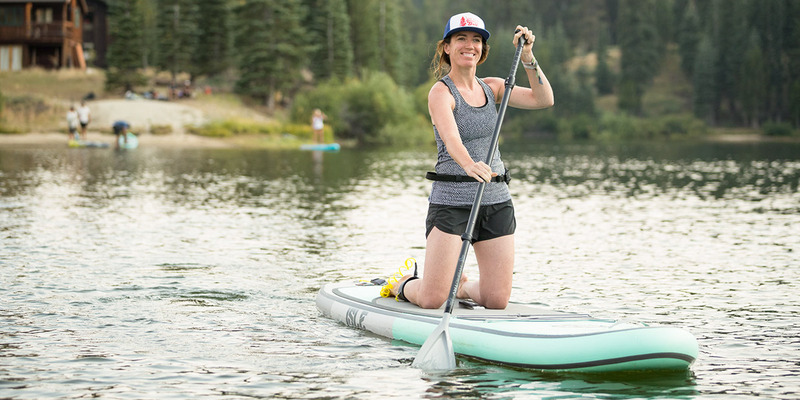 We could go on all day about the benefits of paddle boarding, but today we’re going to focus on how to paddle board and why it’s a great full-body workout. Paddle boarding is not hard. With a few simple steps, you will be paddling like a pro in no time. Follow the steps below to learn the basics of how to stand up paddle board. 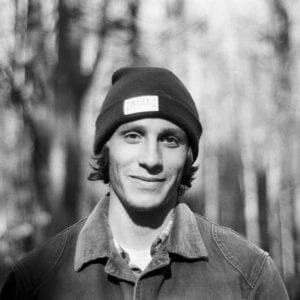 Before you learn there are a few tips you should know. Make sure you’re on a beginner paddle board because they offer the most stability and will be the easiest to learn on. Go to a calm, flatwater destination like a lake in the morning or evening when the wind has died down. Because of the chop, we suggest you avoid the ocean for learning. Don’t fret if it takes you a couple of tries to stand up. Normally, it takes people a few tries to get the hang of standing up. Before heading out on the water, you’ll want to make sure your SUP paddle is sized properly. Learn how to correctly size your paddle here. When entering the water with your SUP, you want to make sure your fins are out of any sand or debris from shallow water. With one knee kneeling on your SUP, push off to launch. First, get comfortable on your knees prior to standing up. Once you feel balanced in a kneeling position, it’s time to stand up. Place your paddle perpendicular in front of you on your SUP. Place your hands on your board for stability. Now place your feet, one at a time, shoulder width apart on the center of your SUP. The center grab handle is good point of reference for optimal balance and paddle efficiency. Be sure to grab your SUP paddle on the way up from standing. Keep practicing standing up until you feel comfortable. When you’re learning how to stand up paddle board there are a lot of common SUP mistakes paddle boarders make. To avoid making these mistakes, we have included some beginner paddle board tips for you to follow. The more momentum you have on your paddle board, the more stable you will be. Just like riding a bike. Posture and stance are important to ensure that you have the most effective stroke and will improve your paddling technique. Don’t stand too far forward on your SUP. Never look down while you’re paddling. If you do, you will lose your balance and potentially fall off your SUP. If you need help maintaining your balance while paddling, focus on something on land or in the water and begin to paddle towards that subject to help you to glide across the water. When standing, you want to be upright with your knees unlocked. Be sure to place your SUP paddle’s blade fully into the water and with the logo facing away from you. To turn your paddle board, you will want to submerge you paddle’s blade into the water and push backwards. This will rotate your SUP. Be sure to plant your feet comfortably, prior to doing so. After reading this, you’re probably going to want to cancel your gym membership. Paddle boarding a great full-body workout for any fitness level. It burns more calories in an hour than most sports because it incorporates all the key elements of a full-body workout: strength, balance, core and endurance. Whether you are recreational paddling, SUP surfing, SUP racing, SUP touring or SUP yoga you’re guaranteed to get a solid workout. 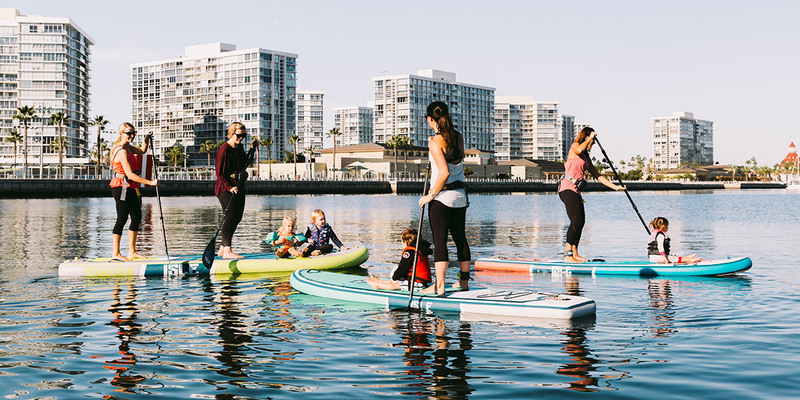 Also, it doesn’t matter what fitness level you are, beginner – expert, everyone will get a good workout while paddle boarding. When paddle boarding, your back, core and leg muscles are constantly maintaining balance, while your arms, back and shoulders are engaged when propelling your paddle board through the water. Continuing this pattern of movements at a normal pace for a duration of time will act as an incredible workout. If you want to take it up a notch, increase your pace and the duration of time and you will be getting an even better workout. 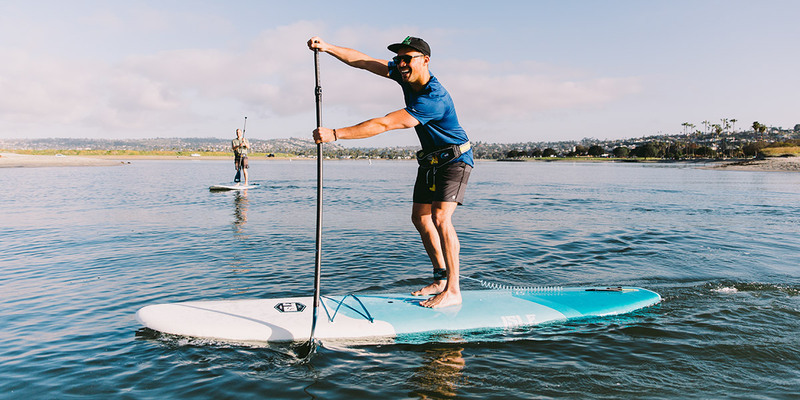 We came up with five fun ways to get fit on a paddle board for those who like a nice change in their paddle board routine. Stand up paddle boarding is not hard to do. It is actually super easy. Compared to most sports, paddle boarding can be learned over the course of a day if taught correctly. Paddle boarding is not only easy, but an excellent full-body workout and gets you outside enjoying Mother Nature. If you’re a more visual learner, please watch the video ‘How to Paddle Board Correctly’ below.